US, 1951, 111 minutes, Black and white. Kirk Douglas, Jan Sterling, Robert Arthur, Porter Hall, Gene Evans. The Big Carnival (Ace in the Hole) is one of Billy Wilder’s most powerful films. It focuses on the role of journalists, especially when there is a media circus. It explores aspects of the ethics of journalism and the activities of journalists. The film focuses on a mining disaster, with men trapped underground. Kirk Douglas portrays a self-interested reporter who covers the event, creating an atmosphere with the town people that brings headlines and highlights. This is one of Kirk Douglas’s best performances. In the late 1940s and early 1950s he appeared in a number of very striking roles including Champion, Detective Story and The Bad and the Beautiful. He was to continue his career into the beginning of the 21st century. Jan Sterling is very strong as the leading actress – and won an award from the National Board of Review. In fact, the film was nominated for an Oscar for the screenplay and won an international award at the Venice film festival. Billy Wilder had worked in Germany, moving to the United States during the 1930s and writing a number of screenplays before he moved into direction with such films as The Major and the Minor and Five Graves to Cairo. At this time he made his mark with Sunset Boulevard. He had won an Oscar for best film for Lost Weekend in 1945 and was to win another Oscar for best director and best film for The Apartment in 1960. 1. The significance of this title and its irony, the actual carnival and the disaster? 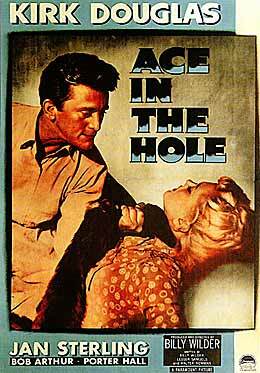 The alternative title was Ace In The Hole. As explained by Tatum, how cynical was this title? 2. The film had no box-office appeal. Is this understandable? How good a film is it nonetheless? In its ugliness and unrelenting cynicism? What is impressive about this film? 3. What is the basic audience response to the film? Can it be called enjoyable? The message and impact of the film? 4. How pessimistic was the film? Too pessimistic? Traces of optimism in the end? Did the whole film seem genuine in its approach to its problems or did it seem contrived? If contrived, did this detract from the impact at all? 5. How authentic did the film seem? The presentation of people, ordinary people, strange events yet credible, the atmosphere of fakery which could be constructed? The black and white photography, the location photography, the implements for rescuing Leo, the carnival itself, radio and television and the media, even the song about Leo? How did this authenticity involve the audience? 6. Were the issues raised in such a story real issues about people and humanity? About the quality of individuals' lives and ambitions, questions of integrity, greed, self-interest, mass curiosity and hysteria, unscrupulosity? How well did the film explore these real issues? 7. How interesting was the character of Tatum? How typical of a cynical man was he? Was he in any way attractive or sympathetic? A loner? Was he still a loser at the end? The power of his manipulation of people, the pressure he brought to bear? The vitality of Kirk Douglas's performance? An ugly and pushy character, contriving and exploiting people and situations? His exploitation of feelings: Leo, Lorraine, Mimosa, Boot, the Sheriff? How admirable was his shrewdness, how frightening? His reading people's characters and exploiting their worst traits? The sheriff, the engineer, the journalists, Lorraine? The reality of power, his position and status, his revenge on the journalists, money? His use of photos, pressurising New York? What impact did this characterization have on the audience? 8. Why did he change at the end? was this credible? was it part of his loser script? The impact of Leo's death, the failure of the story, the repercussions on him? His horror at the stabbing and everything going wrong? Was this an appropriate ending for this film? Did it afford it necessary relief? 9. How well drawn was the character of Lorraine? Her Baltimore background, marriage, cheapness? Her relationship with Leo and his admiration of her? Her being prepared to walk out? Her response to Tatum, love, being hit? The reason for her staying? The money and the power? The reason for her leaving at the end and the way that this was filmed? How cynical was the presentation of this woman? 10. How did Herbie contrast with Tatum? Why did he so admire him? Naivety? Even following him away from the position on the paper? 11. How cynical was the presentation of the sheriff? Throwing his weight around, using influence, conniving in the suffocation of Leo? His looking for votes? 12. The pressures brought to bear on the engineer? Should he have stood up for the alternative method of rescuing Leo? Bowing to the sheriff etc? 13. What comment on ordinary people did the ordinary people in this film make? The couple who arrived first and stayed? People's curiosity? The people who offered the advice? Participating In the carnival and the souvenirs? The song? The TV and radio interviews etc.? 14. How did Leo himself contrast with this? His initial greed, yet his love for Lorraine, his humanity, reliance on Tatum, seeing the priest at the end, the pathos of his death? 15. The importance of the Albuquerque paper background? Boot and his integrity and hiring of Tatum? His disillusionment with him? The irony of Tatum's going back and trying to tell the story? The impulse for confession? But its not being understood? 16. What were the basic values behind this exploration of ugliness and evil? The film echoed a lot of cynicism? Was it cynical in itself?